The Model 278 features a 5 pin terminal strip. PRYDE Measurement has introduced the new Setra Model 278 barometric pressure transducer that is ideal for Automated Weather Systems (Aws) applications. It features low power consumption, while its instant warm-up feature makes it suitable for environmental applications where pressure readings must be taken quickly. In addition, the transducer's compact size (92mm x 61mm x 25mm), 1/8" barbed fitting for push on tubing and a 5 pin terminal strip for connection makes it easy to install and convenient to use. 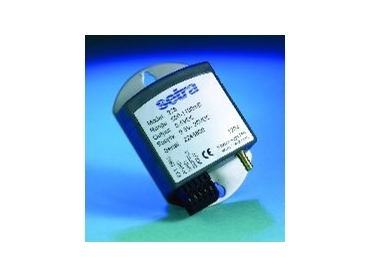 Using Setra's long proven Setraceram variable-capacitance sensor, which is a symmetrical ceramic capsule that deforms proportionally to applied pressure and patented electronic circuitry, the Model 278 barometric pressure transducer provides excellent thermal expansion co-efficient and low mechanical hysteresis, which contributes significantly to its long-term stability. Designed to be environmentally rugged, it has full temperature compensation over the range of -40°C to +60°C and ±0.5hPa/mb accuracy. Offered in absolute pressure ranges from 500 to 1100hPa/mb, 600 to 1100 hPa/mb and 800 to 1100hPa/mb, the transducer provides long term stability of 0.1hPa/mb full scale per year. Outputs of either a 2.5Vdc or 5Vdc are available with 9.5Vdc to 28Vdc excitation.